We are a family of four, myself Mum, dad Peter, Alex who is almost 7 and Toby who was born in 2012 and turned 2 years old a couple of months ago. Toby has Down syndrome. We live in a small village called Rainhill, in the St Helens Borough, just outside Liverpool. After attending an ante-natal class that suggested home birth, I decided that it seemed like a good idea, so that’s what I did. Toby’s birth was quick and pretty uneventful. 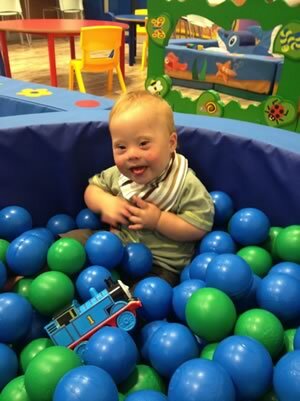 I had opted for no screening blood tests during pregnancy and we were told within an hour of Toby being born that he had Down Syndrome. 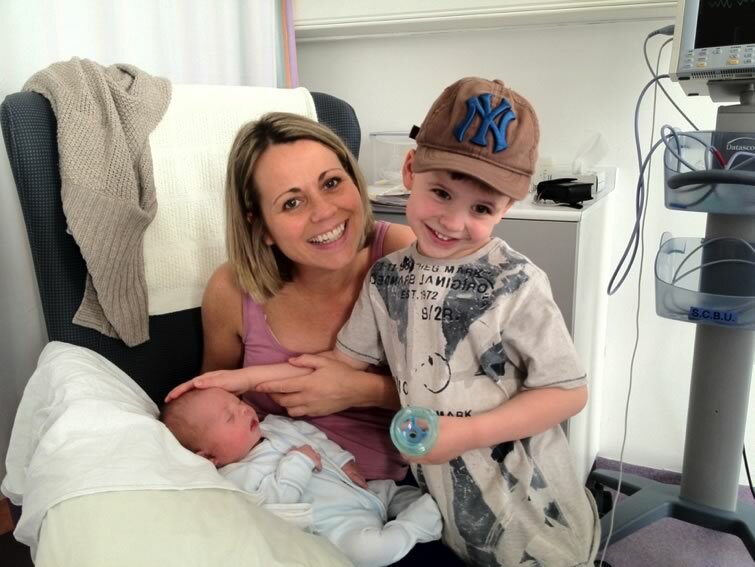 I was very fortunate that my ante-natal clinic midwife was on duty when I went into labour, so it was her that broke the news of Toby’s diagnosis. I feel very fortunate, as she handled it with total sensitivity and as should always be the case, I was holding Toby when told and my husband was there by my side. We took Toby to hospital where he and I stayed for 18 days. Toby was displaying symptoms of a possible heart defect and a possible infection such as meningitis. However, by day three he just got better and better and Toby turned out to be really well and was just fooling the doctors. He came home and was on oxygen for about 6 weeks. Once we got home from the hospital, my local health visitor arranged a home visit. On that first visit, she informed me about The Bridge Centre, St Helens Children’s Disability Service, and asked if I would like Toby to be referred to them. I had no hesitation in saying yes, as I wanted all the help and intervention available. The Senior Portage Worker from The Bridge Centre came to visit us, explained what Portage was and asked if I wanted to receive it. My answer was a resounding YES. I had to go on a waiting list and Toby began his Portage journey when he was 6 months old. I was offered a weekly home visiting Portage service. My Portage Home Visitor, Nicola spent the first few weeks carrying out a baseline assessment of where Toby was in his development, she was then able to see which areas we needed to work on to further his progress. Weekly or fortnightly she will write out an activity chart with a specific target, how to achieve it and how to praise and record his progress. With such a busy and hectic life, these charts are invaluable to me to remind me to work on these targets. The early targets were as simple as getting Toby to shake a rattle independently, beginning with hand over hand and then removing the support until he achieved it. A more recent target has been to get him to pick up finger food and self-feed, it was this target that I was most proud of. I found myself using the Portage principles of small steps to enable him to gain this skill. As soon as our Portage sessions began, I felt that Toby’s development was constantly being monitored by a professional who really cared. This enabled me to focus on Toby rather than on his disability. When Toby was 9 months old we discovered that Toby had developed Infantile Spasms, a potentially catastrophic form of epilepsy. Nicola was the first person I contacted and I forwarded her some research I had found and valued her thoughts. This clearly demonstrates the huge supportive role that my Portage worker holds in our lives. Portage doesn’t stop during the school holidays. In fact on many a home visit during the holidays, Nicola has involved my eldest son, Alex in the learning play and he joins in with the games too. If I have been unable to attend a Portage session due to a meeting, Nicola has been happy to come as normal and involve my mum in the session. It was my mum that was there with Nicola when Toby first signed ‘car’. Nicola is a level headed support, constantly allowing me to see all the positive things Toby is achieving and how far he has come. I often have wobbles about not being a good enough mum for a child with additional needs. It always seems to be Nicola that gets the brunt of these insecurities, and always, without fail she somehow makes me feel a little better. The partnership working that the Portage Service has with other services has been really helpful & supportive. Nicola attended Toby’s first hearing test to support myself, as I was concerned about what was going to occur and how they would assess Toby. Nicola knew him very well and so could help me answer their questions. It was also Nicola that contacted Occupational Therapy Services and arranged a referral to enable Toby to get suitable seating for the house. Toby also has eye appointments, physiotherapy appointments, general hospital appointments, and audiology appointments. For all of these Nicola supports and sign posts me if I have any concerns or questions. On our first Speech Therapy appointment, I came away very disappointed on how it had gone and discussed this with Nicola. As a result of this Toby was allocated a different therapist and now Nicola and the speech therapist arrange joint visits. By doing this Nicola works on speech targets during our Portage sessions. The Portage service has offered support & signposting, often giving me a head start on information. An example of this is the 2 year funded nursery place. Nicola told me about this funding well in advance of needing to know, enabling me to get used to the idea before we started to plan any transition. When the time came to choose a nursery, Nicola chose a selection of local ones & I also found a couple. Nicola then rang them all and made appointments and we both went together with Toby to visit them all. This really took the pressure off me and enabled me to focus on choosing the most suitable setting. Nicola helped with some of the questions and we chatted through our thoughts after each visit. This helped build a clear picture in my head and helped my decision making. The nursery I decided upon was out of my borough and it was Nicola who requested cross borough funding from the local authority. I find myself now carrying out my own little Portage sessions on the carpet with Toby. I follow the child led play approach, Toby goes off and gets something and brings it to me, so I’m led by him and we do an activity together, sometimes hand over hand but always with lots of praise. Portage has been invaluable to my family. Having that positive but friendly professional with me pretty much every step of the way during the last couple of years, and hopefully for another year, has really empowered me to move forward with strength as he makes the transition into pre-school nursery and beyond. 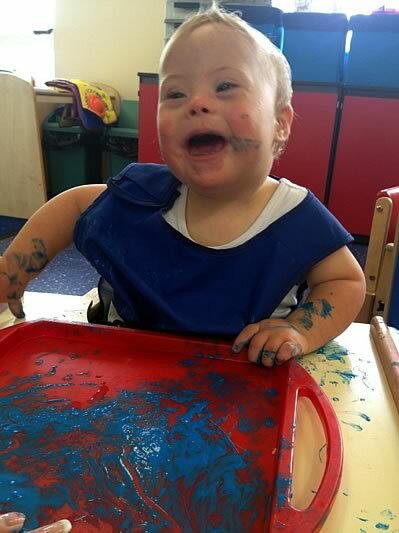 Delivering child led play activities in the familiar setting of the child’s own home, enabling them to learn skills with minimum distraction, to help their development and transition into future education settings is vital to get children with varying disabilities the very best start that they all deserve.